When: 14:00 on Saturday 9th March 2019 until 14:00 on Sunday 10th March 2019. How: To take part, simply turn up and roll. If you want to earn a fantastic custom Meerkatsu t-shirt (kindly provided by Tatami Fightwear), there’s only one way: fundraise! Head here for the main fundraising page. To earn a t-shirt, set up your own fundraising page supporting Womankind Bristol Women’s Therapy Centre, here. (be sure to contact us with the link, so we know you’re fundraising). Note that our limited number of t-shirts will be awarded in order of total amount fundraised, until we run out. Why: On the International Women’s Day 2019 weekend (9th-10th March), we will be supporting the Womankind Bristol Women’s Therapy Centre, a charity that provides counselling for women to improve their mental health and well-being, in order to experience a better quality of life. To learn more about their important work, have a read of their website, here. Donate: Head to our Womankind Bristol donations page, here. 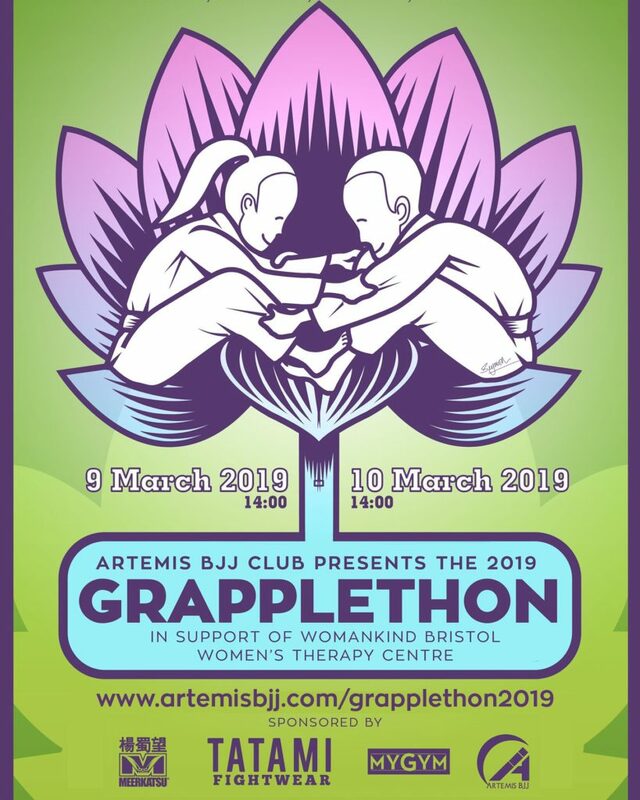 Press: Take a look at the Artemis BJJ press page for upcoming articles and interviews about the GrappleThon (as well as previous events), here. For pictures and videos from both previous and current Artemis BJJ GrappleThons, go to our Instagram channel. Simultaneously with the GrappleThon, we’ll also be running a Rolla(d20)thon, aiming for 24hrs of continuous D&D. So even if you’re not super keen on BJJ, you can still take part (and with WiFi, you can join one of our DnD sessions wherever you are in the world). Thanks to our wonderful sponsors, renowned BJJ apparel brand Tatami Fightwear, top BJJ artist Meerkatsu and of course our awesome hosts, local fitness specialists MYGYM.